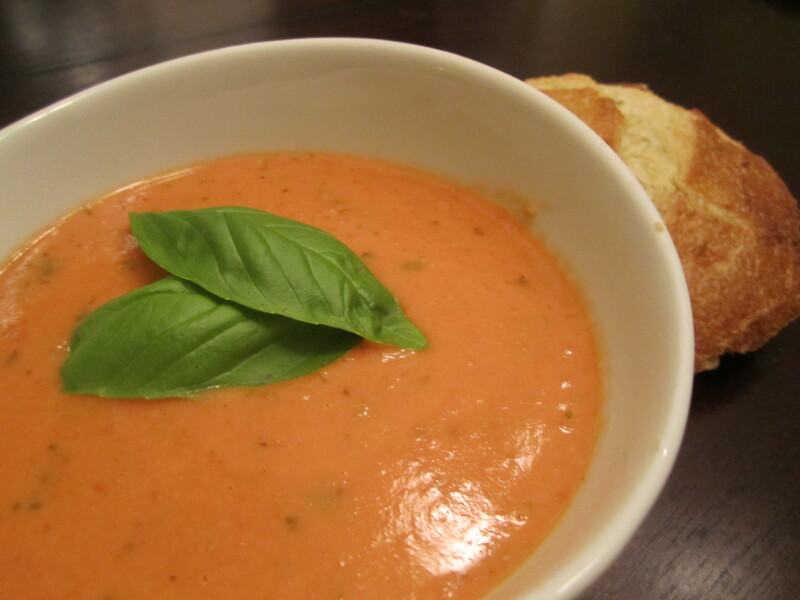 Tomato basil soup paired with a stringy mozzarella grilled cheese sandwich is a classic. It’s been copied and modified a million times over and I still think the traditional rosemary scented soup and crunchy buttered sandwich makes any Tuesday night a little more special. Soup should really be considered it’s own food group. I pride myself in being the sole person to order a warm tortilla soup in the middle of Houston summer, or chilled cucumber-melon bisque when it’s 20 below. (I happened to have both melon bisque and puréed corn chowder with chili oil at my wedding.) There’s something about soup I find utterly addicting. The combination of flavors, the variety of textures, and most importantly the crunchy garlic croutons, crispy bacon, or fresh herbs that get delicately placed on top and slowly sink into the silky, savory bisque. The roasted, sweet tomatoes combined with the tangy bite of rosemary sourdough bread soothes the soul and takes the edge off a brisk day. The bread gives this soup a thick texture with a mouthy richness I often find missing in perfectly velvety broths. Aromatic sweet basil with hints of mint and pepper brighten the flavor and offer you a taste of summer just when you think fall has taken over. Preheat the oven to 400 degrees F. Toss together the tomatoes, 2 tbsp. olive oil, salt, and pepper. Spread the tomatoes in 1 layer on a baking sheet and roast for 45 minutes. In a heavy bottomed stockpot over medium heat, sauté the onions and garlic with 2 tablespoons of olive oil. Add butter and red pepper flakes and sauté for 10 minutes on medium heat. Onions should become transparent but should not brown. Add stewed tomatoes, canned tomatoes (including juice), salt, pepper, and Italian seasoning in a large saucepan on medium heat. Roughly tear the bread into smaller pieces and add to the pot. I break up the bread so it’s easier to spoon out and purée. Next you’ll puree the soup in small batches, so I usually remove it from the heat and let it cool a little before I begin this process. The soup should still have texture and not be completely smooth. The soup will not be nearly as enjoyable if it’s perfectly silky in texture. Carefully puree, along with the basil leaves in small batches. You can use a blender, food processor, or better yet, one of those handy hand-held food blenders, right in the pot. If you use a blender BE CAREFUL! The heat will force the top off the blender and you’ll be cleaning soup off your ceiling for weeks, or you’ll burn your hands so just fill it up half way and pulse it gently. Return to saucepan and add cream and milk, while stirring, over low heat. Garnish with basil leaves, mozzarella cheese and serve with a warm slice of sourdough bread. For a healthier version, leave out the butter and replace the cream with non-fat milk. Enjoy! Hummus is one of my go to’s when organizing my list for party snacks. It’s far healthier than the traditional ranch dip (although that does have it’s place at times) and packs huge flavor in a small bite. It’s also an impeccable match for vegetables, breads, chips…. pretty much anything you like to dip. It’s one of those dishes that will leave you with a perfectly clean bowl and happy, full stomachs after every party. 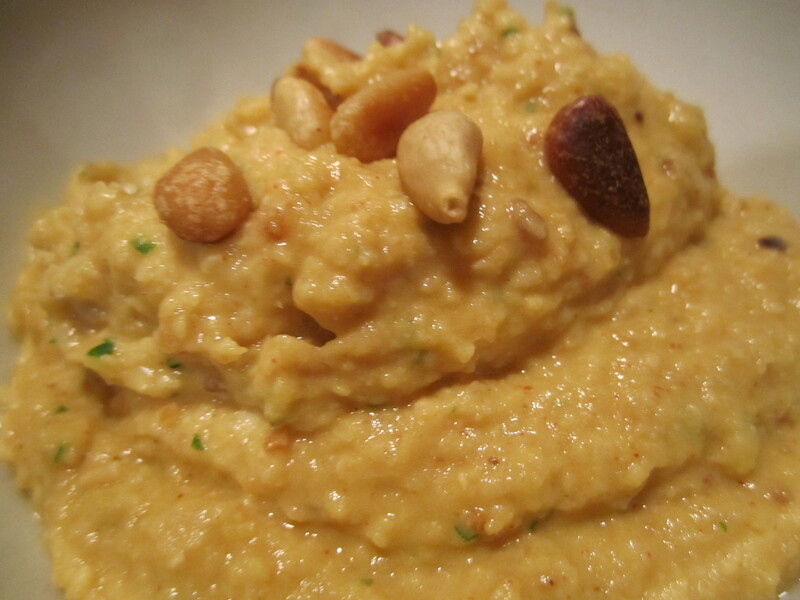 Hummus is a Middle Eastern spread or dip made with chickpeas, which are also known as garbanzo beans. By themselves, I’m definitely not a fan, in fact, I hate them. I pick them out of soups and salads, and toss them away without the littlest thought. I find them mealy, dry and flaky and have no need for them. But all blended up in the food processor with some other goodies and they make a fantastically good dip! I can’t resist the creamy deliciousness that makes simple pita turn into a delicacy. Serve it with some olives and a glass of wine and you’ll feel like you’re on a Greek vacation… ok, maybe that’s a slight exaggeration but it will make your ordinary Tuesday something special. Once oven is preheated, toast pine nuts for 10 mins. Keep your eye on them; if your oven runs hot or it’s touchy, you’ll want to check on them after 6-8 minutes to make sure they don’t burn. You can also do this in a dry skillet on medium heat. Serve with chips, pita bread, jicama, or carrots…. Anything you like to dip! If you’re feeling like really treating yourself, you can make homemade pit chips to go with your hummus. They beat the ones from the store any day. 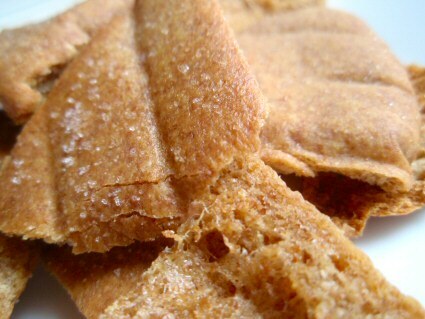 Preheat heat oven to 375 degrees F.
Pour olive oil into a bowl and brush pita chips with olive oil on both sides.